> CyberSource EMEA > Machine learning: a silver bullet? It has to be quick and easy for people to pay. At the same time, fraudsters are probing the weaknesses of new digital processes. As the person who can decide whether a transaction is accepted or rejected, fraud managers have a pivotal role. They’re not just preventing losses from chargebacks. They’re gatekeepers to accepting more revenue. It’s a complex job. But get it right, and they enable their business to engage customers better – across devices and places. And that can mean supporting the very growth of the business. In this landscape, the idea that a technology like machine learning might be the answer to all the industry’s needs is attractive. 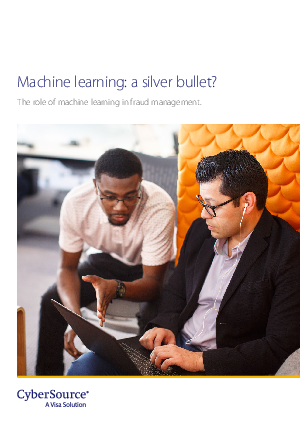 But while machine learning should be a key part of an effective fraud strategy, the truth is that there’s no silver bullet. So, in this paper, we’ll look at how best to put machine learning to use. By employing it in tandem with expert insight, merchants can use it to accept the optimal number of payments. And make a direct impact on the success of their businesses. In this white paper, we address questions like: What is machine learning? What can it do? What can’t it do? What does this mean for merchants? And how is machine learning integral to CyberSource’s Decision Manager?